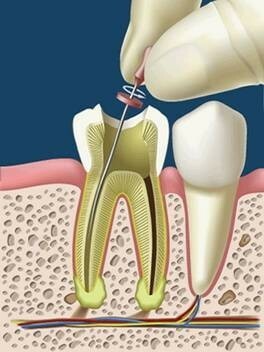 An endodontic treatment is the treatment of the root canal. This corresponds to every therapy focused on the dentin-pulp complex (in other words, the dental pulp and its dentin) of a tooth (the right term in relation to this would be dental organ). Endodontics is also a dentistry specialty recognised in 1963 by the American Dental Association. Endodontic therapy covers from protecting the pulp (directly or indirectly) to the complete removal or the pulp. An endodontia is offered in cases where the dental pieces are broken, with deep caries or with injured pulp tissue (loose connective tissue. This injury may be reversible (the pulp inflammatory process can be reverted by using pulp protection endodontic maneuvers) or irreversible, when the only option left is the total removal of the dental pulp, and the subsequent tridimensional filling of the root canal. Pulpal debridements are also carried out in dental pieces for prosthetic purposes (fixed dental prostheses). When should an endodontia be done? It should be done when the condition has made its way into the pulp, so the root canal can be sealed. Uniradicular / single-rooted endodontia: when a piece with a single root and a single pulp canal is affected. Double-rooted endodontia: when a piece with two roots and two pulp canals is affected. Polyradicular endodontia: when a piece with more than two roots and several pulp canals is affected. A single root and a single pulp canal.